In this in-depth guide, you’ll learn why companies are moving away from integration platforms as a service (iPaaS) tools and towards a new category of Cloud software: General Automation Platforms (GAPs). General Automation Platforms enable business professionals to automate processes across any number of applications and departments so that they can scale their growth and productivity. Part One: What Are General Automation Platforms? Part Three: How Are General Automation Platforms Different? 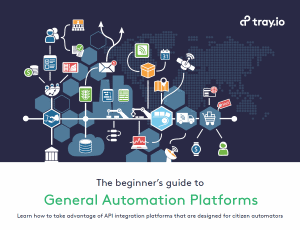 To see exactly how you can benefit from General Automation Platforms, download this guide. We believe that any business professional should be able to connect their entire cloud software stack easily and automate complex processes to scale their growth.